Apple released Watch OS 1.0.1 update with some bug fixes and performance improvements. 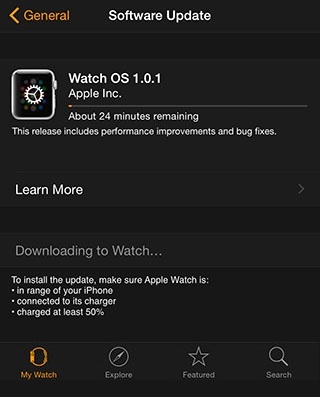 If you want to know how to install Apple Watch software update, here’s the guide. If you want to install Apple Watch update, make sure Apple Watch is in the range of iPhone, connected to the power source (charger) and it have at least 50% charge. Software update installation process might take 20 to 30 minutes. On your iPhone, open Apple Watch companion app. Go to General -> Software Update – Download and Install. It will prompt for iPhone password. Enter the password and press the Done. Select Agree to accept terms and conditions of the update. Now it should start updating your Apple Watch OS. 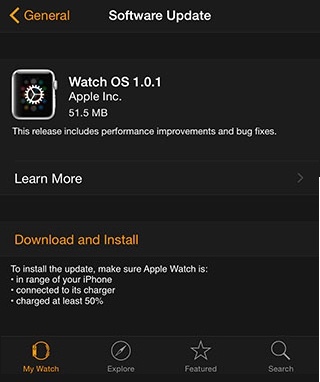 Watch OS 1.0.1 update size is 51.5mb (35mm model). It takes 10 to 15 minutes to download the update. After update downloaded it will show “preparing” for the update. Before installing update, it will check the Apple Watch have at least 50% charge and it connected to the charger. If it not have enough charge or connected to its charger, it will pause the installation. Select OK after the update conditions have been met. It will proceed the installation process. Now installation process switches to the Apple Watch. Companion app will inform you that software update being installed on apple Watch. When Apple Watch update installation starts it will restart the Watch and display the installation process. Apple Watch might reboot 2 or 3 times dusting the installation process. After the update installation process complete, it will restart your Apple Watch.